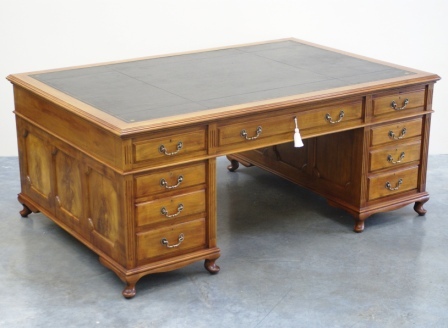 A very high quality Large Antique Partners Desk in fine figured mahogany. Dating from the Edwardian period c1910 having the original gilt tooled black leather writing surface. Classic nine drawer front elevation with the rear having three frieze drawers and two shelved cupboards i.e. total of 12 drawers and 2 shelved cupboards. Original handles and full set of matching "Hobbs" locks with keys. Panelled sides and small cabriole feet. This desk formally resided in a country house in Suffolk where it had probably been since new. Magnificent! Large and substantial desk - comes in three pieces - two pedestals and the top.